My Journey to Fit: Lucky Us! Lucky us, indeed - Jeff and I got to spend Saturday with our friends Terry and John, on board their boat, the Lucky Us! Terry and John have owned the boat for about five years now, with plans to travel the Great Loop for a year (or two) once Terry retires, which is in six months. While I'm happy for them to get to live out their dream, it's coming soon, and that means I won't be getting to have my weekly lunch with Terry, which makes me sad. 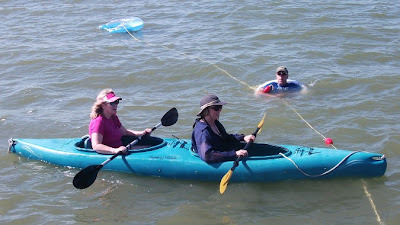 But Saturday was a happy day - thanks to Disappointing Don (aka Tropical Storm Don, who did not bring Texas our much-needed rain) not appearing, we had a beautiful day on the water! Here are most of the pictures from our day - I'm saving a silly set for Friday's mishmash - but this tells the story pretty well. The boat! It's a trawler - see that uppermost part? That's the flying bridge, where I pretended to drive the boat when we first got on board. Look at their fancy Garmin! Kinda puts Ricky Bobby to shame...this thing was pretty cool. Terry finishing the launch procedures - note the headset she's wearing...both she and John wear them for launching and docking, which makes communicating a breeze - no having to bellow to each other. John says these headsets are referred to as "marriage savers" in the boating world, lol. And we're off! As we headed out to Galveston Bay I noticed the flag art on the bridge as we approached it - do you see it there? On our way out, we went by the Kemah Boardwalk - I've never been there and of course now I want to go! See The Beast? No, not Jeff (haha, I crack myself up!) - the boat with the painted-on teeth! We saw that boat out in the water - the people on board were getting completely drenched, and I'm sure, having a blast! Big, big ships - we were on the outskirts of the Houston shipping channel. Admiral Terry piloting the boat - doesn't she look like she was born to do this? Random pelicans on a marker. Our destination - Redfish Island - just a little hook of a sandbar, basically, where lots of boats drop anchor and hang around. I thought the island was made of sand, but it's all shells and some big rocks. Plus a lot of debris from storms. This is one island I would hate to be stranded on - no shelter at all! Garmin shot - although it says the depth is less than three feet of water, that's after the keel, which is about another four feet, I think - so we were in about seven feet of water. You'd think it would be much deeper, since we were in the middle of the bay - well, at least, I would! Captain John and Jeff, just after we set anchor. Ready for a fun day in the water! I was surprised at how long the stinging lasted...and then, periodically, I would get another zap of a sting throughout the rest of the day and evening! Terry got out of the water and Googled what to do about jellyfish stings (of course you know Jeff was offering the pee cure, which I was not going for - it didn't hurt THAT bad) - vinegar was one recommendation, and she had some on the boat, so we tried it. I guess it helped a bit - I have a pretty high pain tolerance, so while it was uncomfortable, it wasn't like I was dying of pain or anything. Terry and I decided to get out their kayak and paddle over to the island - you know, I don't think I've ever kayaked before, but I did great! We paddled (thank you, swimming, for giving me strong arms that didn't get tired) to the island and walked around it for a bit, where of course I had to collect some shells. These were mainly oyster shells - it really was incredible to be on a piece of land that was made entirely of shells - no sand, no dirt - yes, I am easily amazed! Admiral Terry and I - two sporty girls! Jeff is floating with the jellyfish. Relaxing on the ride back. LUCKY YOU...even with the stingthing. Beautiful pics, Shelley & relaxingrelaxing indeed. OMG, I am so jealous, and having such nostalgia flashbacks!! My parent owned cabin cruiser boats my whole childhood; I miss boating so, so much. The best part were the headsets; we did not have those back when I was growing up, and your friend is not kidding about them being marriage savers. I have such "fond" memories of my parents yelling bloody murder at each other as my dad tried to steer and my mom tried to work all the lines and get us out of the space. Heehee!!! What a lovely post to read on a Monday morning. Oh Shelley what a wonderful day the four of you had. It was so much fun reading it and looking at the pictures! The jelly fish would have freaked me out. I'm very carefully going into open water since I stepped on a dead fish when I was 11 and it caused an infection which got me in the hospital for 4 weeks and left me with a heel that never recovered completely. But enough about me: you had a wonderful day my friend. What a great day! Even with the unfortunate sting and pee-cure offer! What a great boat - and go to Kemah - it's great fun. Isn't kayaking awesome? You don't need a reminder to SMILE! Great pics. Every time I hear about the pee cure I think of that Friend's episode. LMAO. Sorry about the sting. So jealous of your lovely day. Up here in New England we teach our kids to grab some sand and "scrub" the jellyfish sting with it. Works pretty good - I think it helps get the stingers out. What a fun time - like a vacation all in one gorgeous day! Ooh, I am creeped out by the jellyfish sting! And it is too weird that I am up here on the water taking pictures of boats and stuff to share on the blog when I get home! Other than the sting, what an AMAZING day!!!! (Love the name of their boat!) I fully expected you to write that one of the gang pee'd on your sting...ah, ha, ha...Thanks for sharing the pics of your wonderful adventure. Have a good Monday Shelley! The Great Loop looks awesome - thanks for the link. Terry will have to keep a blog when they do that so we can follow along. Fantastic weekend!! You were in Kemah?! OMG, can't believe you were so close to us. I love the Boardwalk. Sorry to hear about that jellyfish sting though. Ouch! Ah, memories. Once upon a time I had a boat docked at that very marina and would sail to Redfish Island (thought the darn thing had disappeared!) and sometimes down the ship channel to Galveston. Looks like a grand time - well, except for the jelly fish sting, ouch! Ow! You must have a tolerance for pain because I would have been crying like a baby! Great pictures of a beautiful day. What a perfect weekend Shelley! Ah, jelly fish stings. The worst was when I was about 10 - we got to my Aunt's house and I got my suit on, ran down the dock and jumped in - only to jump into a whole school of jelly fish - I got stung a dozen times - it ruined the whole day, but I've never gotten out of the water faster! When we vacation we rent a boat for a day - its easily our favorite day of any vacation. Seems like a great way to spend a hot TX afternoon. I think I recognize Jeff's sunglasses. I once floated in a lake and was skimmed or bit by a fish. I think it was a catfish. They have dangerous flippers. Anyway, I came up bloody, blood running down my stomach, scared out of my wits. You are courageous to swim with the sharks, jellyfish and Jeff. John and I were just talking about getting headsets like that while we are biking. cool. 1. I LOVE boating. LOVE it. Sailing NO. BOATING YES. 2. damn jellyfish!! That looks uncomfortable! Looks like you had a great time. I've had jellyfish stings before and they were not too bad. We didn't see any while we were there, but we were not out in the middle of the bay. What a great way to spend a day! Eeeek! I've never been stung by a jellyfish before, but just knowing it's possible (I try to pretend I'm invinsible to scary things) makes me a little freaked out! You so need to go to Kemah's Boardwalk sometime - it's a lot of fun! I want to go out on a boat now. That looks like so much fun!!! I've been stung too when I was little and I still remember it! I am almost speechless with jealousy...except for the jellyfish thing. Glad to hear you made the most of an awesome day nonetheless! Beautiful photos, though the jellyfish thing is a bit of a bummer! What a beautiful day, despite the jellyfish sting, ouch! I've never been stung by a jellyfish luckily. I think vinegar works too, right? What a great time this looks like (minus the jelyfish sting which by the way looks terrible!!!) I hope it is all better now??? Isnt kayaking so much fun? And see...your swimming is definately paying off!!!! Wow, what a beautiful, fun looking day! And lovely photos, thanks so much for taking us along Shelley! It looks SO fun! Sorry about the jellyfish though.